It’s been quiet on the blog for a while, but now I’m getting some time to write again. 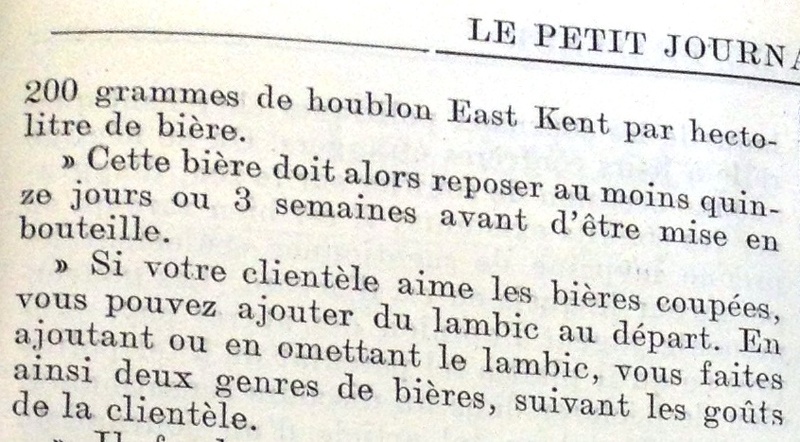 I wanted to start off with some more historic beer research – this time with info about kriek from Petit Journal du Brasseur in 1907. This volume includes two short sections on kriek production: one is an article from Robert Jordens and one is an answer to a brewer’s question. Schaerbeek Cherries near Beersel, Belgium. To start with, I think I should give a bit of general background. I'll be using kriek here to refer to lambic with sour cherries, rather than the cherries in general or any other base beer with sour cherries; however, the Dutch word "kriek" simply means sour cherry. The articles by Jordens notes that kriekenbier, beer with sour cherries, is made elsewhere but that kriekenlambic (much like lambic) is native to Brussels and the surrounding region. This article also refers to kriek lambic as “Belgian Burgundy”. Oude Kriek and Kriekenlambic do have some legal protection (see also: here), which sets out ranges of fruit, some process/fermentation requirements, and some parameters of the wort. In addition, the "Oude" designation requires secondary refermentation in the package, conditioning on lees, and some characteristics (e.g. minimum acidity) of the final beer. 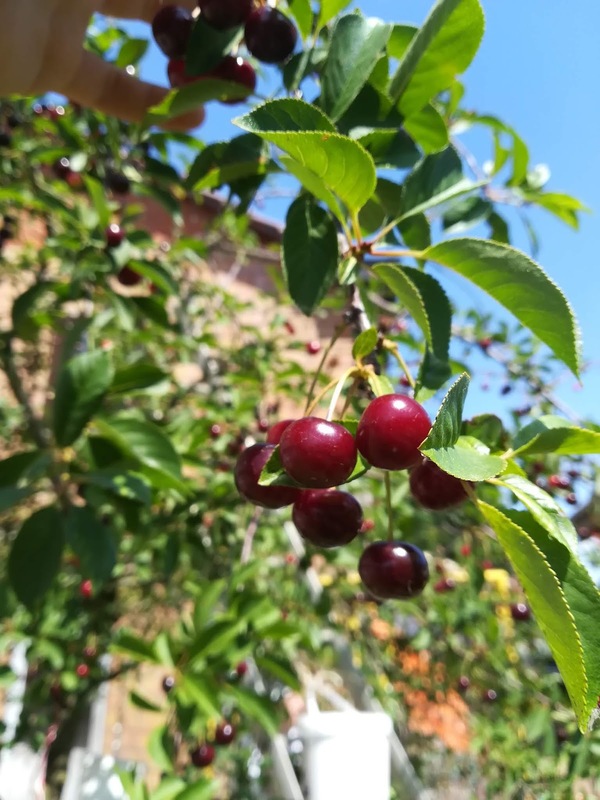 Both designations appear to allow the use of cherry juices or concentrates and, interestingly, set a maximum cherry percentage which at least some commercial producers using the designations exceed. I found these surprising, and perhaps there is some updated legislation surrounding these. denoting it has a square bung. Schaerbeekse cherries are recommended. The article notes that some use Cerise du Nord (perhaps these are what you can now find called griotte du nord or Chatel Morel), sometimes mixed with Schaerbeek cherries, but that Cerise du Nord were not usually used alone as they are less fine and more acidic. The cherries are used whole (with pits) and fresh. Specific ratios of cherries are discussed below. The texts also recommend adding a sugar syrup (1/4-1/3 L per HL of beer) and a small amount of Ceylon cinnamon (10g / HL) with the cherries. The inclusion of cinnamon here is quite interesting. Cherry pits can give a character often described as almond-y, and which I perceive as also being cinnamon-y. So the inclusion of a bit of cinnamon, to “enhance the cherry flavor" (original French: "…cannelle de Ceylan pour relever l'arome de la cerise”) makes sense. In case you aren't aware, there are multiple types of cinnamon. Most cinnamon available, either ground or as sticks is Cassia cinnamon. Ceylon cinnamon sticks are visibly quite different and have more of a woody and complex characteristic. Ceylon cinnamon is also sometimes called "true cinnamon". Randy Mosher's Radical Brewing talks about the differences in these two a bit as well. Back to the krieks - I’m not aware of any commercial krieks currently being made with this sort of addition, but I think it would be cool to see at a light level. And, with producers expanding their current offerings, especially with fruit lambics, I wouldn't be surprised to see something like this in the future. The Jordens text notes taking care in choosing which lambic to use for kriek production, with preference being given to more mellow lambic and lambic that is clear. The Q&A article states that 3 year old lambic is too old to use on its own, and gives this ratio for lambics of different ages: 20% 3 year old, 50% 2 year old and 30% one year old. The cherries are then left to macerate for 4-5 months in wood, with one source noting that some brewers agitate the barrels for a month after active fermentation. At this time, seeing square bungs in barrels was common. This made it easier to get fruit in and out. Some barrels with square bungs can still be seen in some lambic cellars, though they are a rare find compared to the common round-bunged barrels now in use. Square bungs on the front barrels - at Oud Beersel. After 4-5 months of contact time with the fruit, the kriekenlambic would be bottled and bottle conditioning would last around 6 months, with the bottles stored at 15-17° C (59-62.6° F) or cooler. In this time the bottles would develop carbonation. There is no mention of blending in young lambic or adding additional sugar solution for carbonation. The bottles were ready to drink after about 6 months, such that the final beer would be ready around the same time as the production of the next batch. Jordens notes that bottles would age well for up to 5 years. Edit 22-Oct-18: It was helpfully pointed out that I didn't include any recipe info for the base lambic. I overlooked this as I've written about it before, but I should have included it here as well. These sources didn't specify, but the lambic would likely have been at least 40% unmalted then, perhaps toward 50%. The remainder would have been malted barley, with the malt pale but likely darker than modern pils and made from winter 6 row barley (escourgeon). Hopping would have been a mix of aged and current harvest hops. I've written a good deal about historic lambic hopping here so check that out if you want more info there, and see this post (with some other ancillary info here) for additional historic lambic production (though from a bit earlier - ~1850). For 1 L of beer used in maceration, you add 250 g fruit. This can unambiguously be used, as it is in this article and as noted in this comment (in the context of fruiting ratios in the barrel of roughly 1 kg/L). But this may not be what is reported in the final ratio on packages. For ~1 L total volume, you have 250 g of fruit (or roughly 750 mL of beer + 250 g fruit, such that the aging vessel is 25% full of fruit) (e.g. here). For a beer and fruit mixture, in the final product after losses and blending, you get 1 L for every 250 g fruit used (e.g. here). If you aren't blending after aging, this is similar to method #1. The key key difference is losses when removing the lambic, and anyone that has aged a beer on fruit knows that the volume they get off of the fruit is less than what they put on. The first method doesn’t account for this. To me this method seems like the best for reporting final fruit ratios, but it is also the least direct from a brewing/fermenting point of view since you don’t reach the quoted ratio until the end when you know the volume you get off of the fruit and what you blend it down to (if you are blending). 480 kg cherries and 500 L lambic. 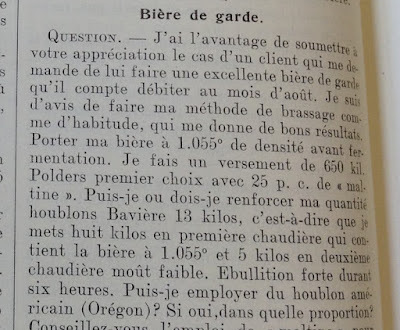 At least the described ratio is clear in this historic article - 160-200 g per liter of lambic. 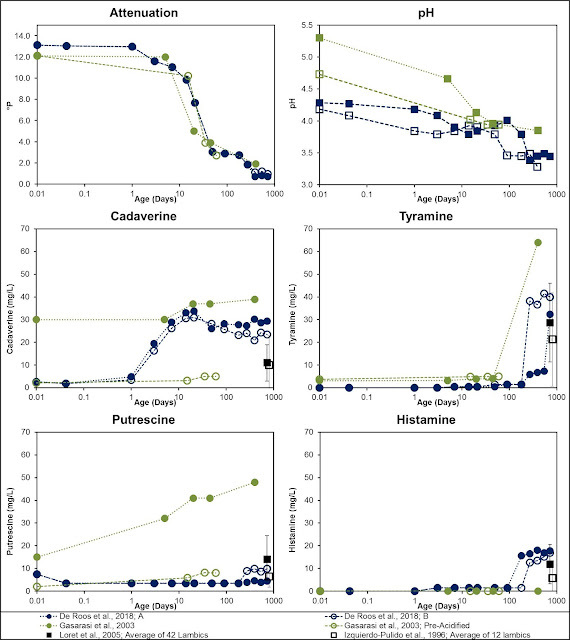 Fruiting ratios are a bit smaller if expressed in methods 2 and 3 than method 1. For example, this historic kriek at 160-200 g/L by method 1 is 138-167 g/L by method 2. Without knowing exactly which method different producers are using, and without knowing the losses assumed in these recipes to convert to method #3 above, it isn't possible to make an exact comparison with modern production. Even without this option, we can see that these fruiting ratios are on the low end or are lower than typically found in modern production (200-300 g/L or more, and with at least some producers using methods 2 or 3 from above to calculate ratios). In addition, with modern production, it is common to age beer at a higher fruit ratio and blend back to the desired level before packaging. There is no mention of blending back in these articles, but going with the assumption that there was no blending back of these fruit ratios from ~1907, these are still lower than modern usage. I know of a couple modern beers with cherries from lambic producers that are around or below these ratios. Girardin Kriek is reportedly 150 g/L. Cantillon Kriek used 200 g/L cherries, which could be at the high end of this historic range depending on which method to quantify the ratio is used. Additionally, Cantillon Zwanze 2014 (technically not a lambic since it was Iris as a base) used a rate of 120 g/L. While there were other assertive characters to this beer on top of a spontaneous fermentation base (dry hopping and the stronger malt character of Iris), the cherries were definitely present. I think working at these lower fruit ratios are worthwhile and could be a good way to let other interesting characteristics come through while still having some cherry. Especially when the base has more character and/or when other additions are made. In disclosure, this suggestion serves my own goals/preferences. I prefer a complex base lambic to a fruit-forward lambic. So if I am choosing something for myself to enjoy, it will almost always be unfruited lambic. And, in general, I have rarely had a fruit beer which I thought was better than (or even equal to) the sum of its parts (in fairness though, I don't know exactly what the lambic tasted like before going onto fruit). Not that I am unhappy to drink fruit lambic, but good lambic and good fruit are almost always better to me than good fruit lambic. However, given the general commercial popularity of fruit-forward beers over their base constituents, I may be in the minority here. 3 Fonteinen – Maceration lasts for around 6 months to 1 year (see here and here), depending on the specific product - the 3 Fonteinen Oude Kriek has a maceration around 6 months (see also here) while maceration for the Schaerbeekse Kriek may last up to or more than 1 year (see also here, with bottle dates suggesting a typical maceration of 6-10 months assuming fresh fruit is used and harvest dates in June/July). The lambic used is roughly 1 year old. 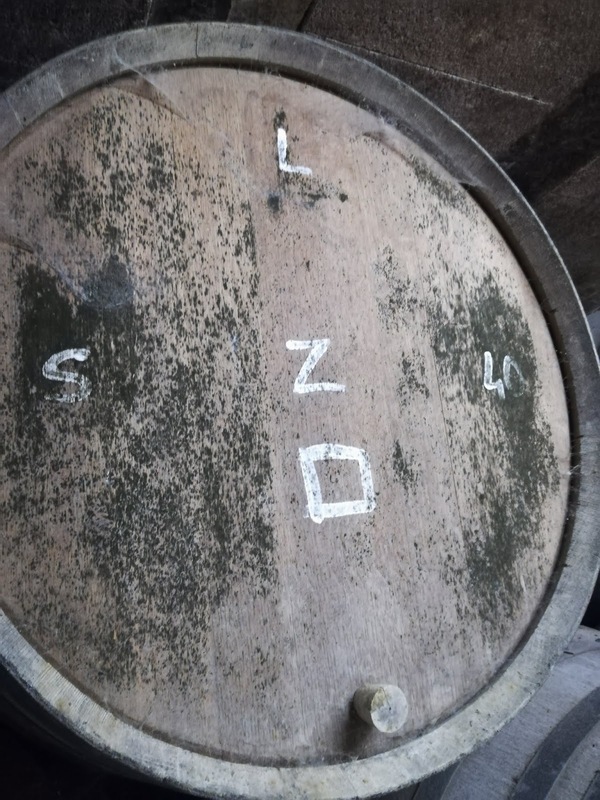 Cantillon – Maceration lasts around 1-2 months and 2 year old lambic is used (see here and here). This is blended back with a small amount of young lambic for bottle conditioning in Cantillon Kriek, while Lou Pepe Kriek is primed with sugar for bottle conditioning. Others - Boon reports using lambic that is 1 year old for their Oude Kriek, and Lindemans reports using lambic that is at least 6 months old and a maceration time of 6 months for their Oude Kriek Cuvée René. According to Lambicland by Webb, Pollard & McGinn, Hanssens uses 1 year old lambic and a maceration time of roughly 1 year to produce their Oude Kriek. 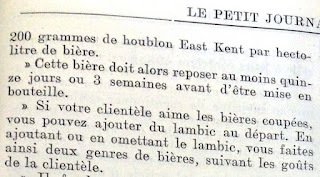 This is part two of a pair of bière de saison recipes presented in Petit Journal du Brasseur, 1905. In the first post I gave a recipe for a bière de saison made from an infusion mash along with some general background info and more specific context for grains, hops, and how the brewing equipment would cause the process to be different from modern equipment. I'll skip repeating that background/context information here, so after a quick bit about turbid mashing then I'll jump into the recipe. This will be followed by a quick comparison of the two recipes to highlight the common ground which serves as a foundation of the beers as well as the room for variability, and some notes on hopping and how I've presented it in my modern homebrew recipe interpretations. Two boil kettles at Brasserie à Vapeur. I've talked about turbid mashing a fair amount on this blog. So in order to avoid repeating too much of that, I'll skip most of that. If you're interested in some of those other posts, here are a few: Brewing Bière de Garde, Thoughts on Johnson 1918, Thoughts on Evans 1905, Homebrew Turbid Mash Petite Saisons. Instead I want to address a terminology question that I've been asked a few times regarding turbid mashes where a saccharification rest is performed after the turbid wort is added back. Basically the question is this: if you add the turbid wort back before a final saccharification rest, is this still a turbid mash (and/or why isn't it a decoction mash). 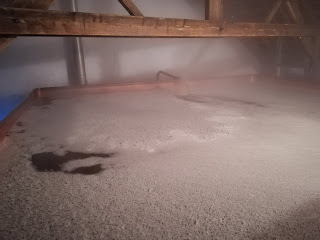 For starters, mashes where turbid wort is withdrawn and added back before a saccharification step are given the same name in French (moût trouble) as the turbid mash process that we may be more familiar with from traditional lambic - where the turbid wort is added back to the mash to be filtered through the grain bed after the first mash runnings are collected. And in the original sources in French these different mashes are not given different modifying descriptions. So the Belgian and French brewers treated turbid mashes where the wort is added back before and after the first runnings the same for terminology. Secondly, I think there is a key difference between decoction mashing and turbid mashing that could lead to a couple different distinctions in the outcome of following these processes. This is the transfer of only mash runnings compared to a mixture of runnings and grain to the kettle for heating. Two boil kettles at Brasserie Dupont. When transferring only mash runnings (and usually a significant amount of them) this should disproportionately remove enzyme activity from the mash. And then subsequently denature these enzymes when the runnings are heated. Perhaps with the remaining mashing process (prolonged saccharification rests) this doesn't end up being a problem. We at least know that this sort of mashing worked, so it must not have been too problematic. Also, when turbid mashing with adding wort back before a final saccharification step, the turbid wort usually skips at least one intermediate mash rest. So proteins may be less converted, whereas in decoction mashing the pulled mash is usually added back for the very next step, and therefore wort does not miss as many steps. Finally I think that transferring mash runnings would result in different color development than the use of a thick runnings-grain mixture in decoction mashing. Maybe these differences aren't all dramatic, but I think they still make turbid mashing distinct from decoction mashing and similar in many (but not all) respects to turbid mashing without a sacch rest for the turbid wort (as known from lambic production). Also, I think it should be noted here that not all lambic producers add the turbid wort back after collecting the first runnings. As a bit of a side note, it would not have been uncommon for Belgian breweries to have multiple boil kettles in the 1800s and early 1900s, While this isn't needed for turbid mashing, for example turbid mashing where the turbid wort is added back before a final saccharification step (as outlined in the procedure here), it would make turbid mashing easier. The other main purpose for these kettles would have been for making a small beer alongside the normal brew with the later mash runnings. So while this recipe uses two kettles as outlined in the text, a second boil kettle could be helpful but not necessary when brewing a recipe like this at home or commercially. There is a lot in the mash that isn't specified (for example, the amount of turbid wort taken out). For this section I'll just present the mash as it is presented in the text and below, where I modify the recipe for a modern homebrew setup, I'll make some assumptions about the liquor to grist ratios and turbid pull volumes. Hydrate the grain to reach a temperature of 35° C (95° F). Rest 30 minutes. Remove turbid wort and send it to the second boil kettle. Infuse with boiling water (this is done by underletting in the commercial brewery) to reach a temperature of 53-54° C (127-129° F). Rest for 10 minutes. Remove turbid wort and send to the second kettle. Infuse to reach a temperature of 63-64° C (145-147° F). Take turbid wort immediately to the second kettle. Then rest for 40 minutes at this temperature. Boil the turbid wort for 20 minutes and add it to the mash tun (at the end of the 63-64° C / 145-147° F) rest to reach a temperature of 73-74° C (163-165° F). Rest 45 minutes. Lauter and collect mash runnings in the primary boil kettle. Sparge at 75° C (167° F). The boil lasted 8 hours, with 1/3 of the hops added at the start of the boil and 2/3 added 30 minutes before the end of the boil. The brewer specifies their total amount of hops (40 kg) but neither their total amount of grain nor their batch size. The journal comments that they are therefore not able to address if this hopping rate is reasonable in their response, and suggests a total hopping rate of 3 kg per 100 kg grain. Based on the infusion recipe, if the OG and efficiency are similar, this would be just under 450 g per HL (0.6 oz/gal) for pre-boil wort, and something like 530-630 g per HL (0.71-0.84 oz/gal) for finished wort, depending on the cooling method. A Baudelot Chiller. This one, at Liefmans, is quite large. Smaller ones (not necessarily in use) can be seen at De Dolle or a Vapeur. Again, as with the other recipe, the cooling method is not specified. But Baudelot chillers or coolships would have been the norm. If you are unfamiliar with Baudelot chillers, the hot wort runs down the outside of a stack of pipes while cold water flows through the pipes, leaving the wort exposed to air as it is cooling. The wort is then collected in a trough at the bottom and sent to the fermenter(s). Both Baudelot chiller and coolships leave cooled wort open and exposed to air. Though there are obvious important differences in time here, a Baudelot chiller is still not an especially sterile way to cool wort. Fewer details are given for the fermentation of this beer than the infusion recipe, but I suspect it followed something similar to the infusion recipe (pitching around 20° C / 68° F, primary fermentation in barrels or open tanks followed by aging in barrels, and either option with aging on the order of 5 months before serving). The article mentions the beer would be served in July or August. -This could be swapped for a 6-row malt, though if so it might be better to select a malt without a super high enzyme potential. You may be able to source something from a local craft maltster like the following: Double Eagle (see their Rustic Ale), Skagit Valley Malting (look for something made from Alba barley), and Riverbend Malthouse (I've heard they make a malt form 6-row, but couldn't find any info about it on their website). The Q&A from PJB 1905 regarding this recipe. 100 g (3.5 oz) Stisselspalt (2.0 % aa). Given the specific mention of Alsace hops I think this makes the most sense, but other landrace hops or perhaps some more modern French hops with a similar profile would work well. You could adjust hopping rates down if going with hops with higher alpha acid levels. See also the notes at the bottom regarding hops and how I have modified these from the original recipe (and maybe adjusted down the hopping rate too far). The more I think about it, the more I think I've over-adjusted. But I'll keep this at 100 to keep it consistent with the other recipe. In brief, the original recipe calls for ~125 g (4.4 oz) of hops, so do that if you want to follow the original recipe more closely. Mash: As noted above, this is an approximation of the recipe based on some volume assumptions (no addition or turbid wort volumes are noted). I think this should work based on past turbid mashes I’ve conducted, but I haven’t had a chance to try this out. So let me know if you run into any odd problems and you think there is an error in these numbers. I’m erring a bit on the wet side for the mash. Especially when it comes to the second and third turbid portions. You could remove more turbid wort, making the mash drier, if you wished. Without conducting it first myself I feel I should err in this way. But I think a drier mash/pulling more turbid wort at later steps would more likely reflect what was historically done. As is always a good idea when conducting a new mash schedule (especially a turbid mash) or changing your equipment, it is best to have extra cold and boiling water on hand to adjust the temps as needed. And also it is a good idea not to max out you equipment to allow room for any adjustments. Dough in by adding 4.1 kg (9.0 lb) malt to 8.5 L (9.0 qt) at 38.3° C (101° F). This should give you 2.1 L/kg (1.0 qt/lb) at 35° C (95° F). Rest 25 minutes. You could also add water to grain, but with a drier mash I find it easier to add grain to water. Take the first turbid pull. I am guessing this would be around 1.7 L (1.8 qt), leaving you with around 1.67 L/kg (0.8 qt/lb) remaining in the kettle. Start heating the turbid pull, being careful not to scorch it. 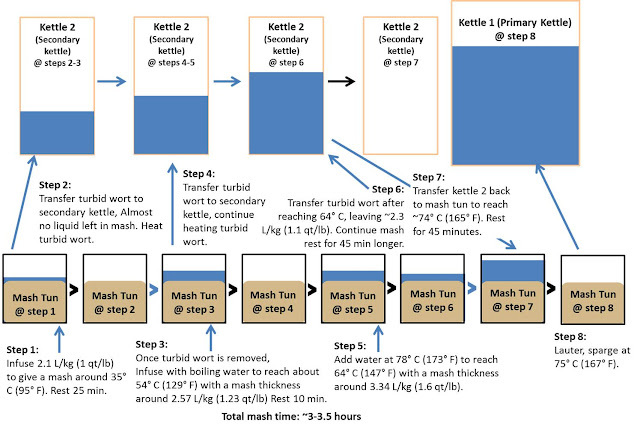 Add 3.7 L (3.9 qt) boiling water to the mash to reach 2.57 L/kg (1.23 qt/lb) at 54° C (129° F). Rest 10 minutes. Take the second turbid pull. I’m guessing around 3.0 L (3.2 qt) would be about right, leaving you with 1.84 L/kg (0.88 qt/lb). Add 6.3 L (6.67 qt) water at 78.3° C (173° F) to reach 3.34 L/kg (1.6 qt/lb) at 64° C (147° F). Immediately after this new temperature is reached, take the final turbid pull. This should be around 4.26 L (4.5 qt), leaving you with roughly 2.3 L/kg (1.1 qt/lb) in the mash tun. Heat the turbid portion to boiling. Let the mash rest at 64° C (147° F) for another 40 minutes. Add back the turbid portion. By my calculations this should be around 8.8 L (9.3 qt) and about 85° C (185° F) is the right temperature to reach 73-74° C (163-165 F). This should give you a mash around 4.5 L/kg (2.15 qt/lb). Rest here for 45 minutes. This may require letting the turbid wort cool a bit before adding it, or mixing some cold water in. Lauter and sparge as normal. 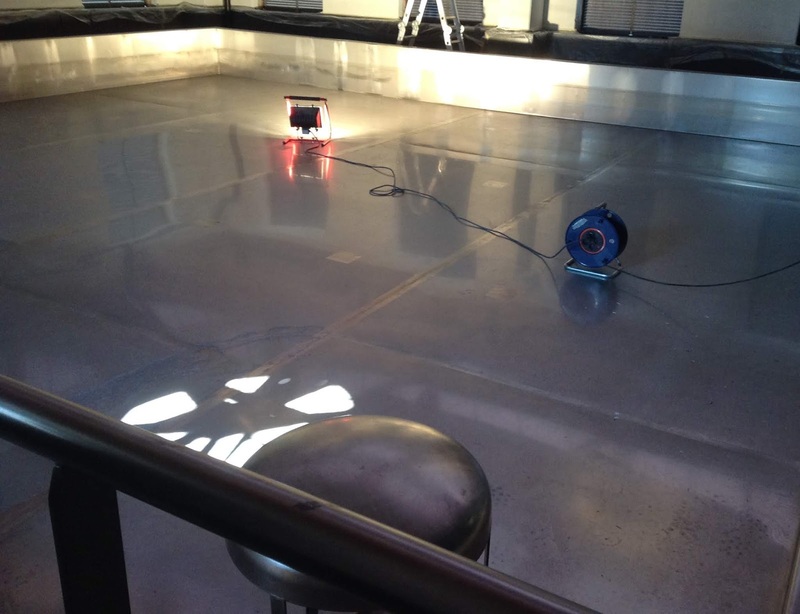 Sparge water was listed as 75° C (167° F). A schematic of the mash schedule, adapted for a homebrew scale with assumptions regarding volumes. Boil: If you want to stick with this recipe then you're doing an 8 hour boil. This is quite long and you could probably shorten it if you wanted. Especially if such a long boil wasn't necessary to hit your target numbers. This will change melanoidin formation, but I think going for 3-5 hours would probably be a reasonable compromise here. And of course you could still make a beer following these guidelines with a 60-90 minute boil, but there would be some differences. Split the hops between the start of the boil - 1/3 of the total hop dose, or 33 g (again this can be adjusted based on aa) - and 2/3 of the hops, or 67 g, with 30 minutes left in the boil. See the note at the end about hopping rates in these homebrew recipes. Cool the wort as you prefer - open in a kettle/coolship or with some sort of chiller. Fermentation: I would take the same approach to fermenting this beer as I suggested for the other saison recipe. So that would include pitching a mixed culture that you like with yeast and lactic acid bacteria. I’d aim for something that includes some more hop-tolerant bacteria if you can. And I personally prefer to do mixed primary fermentations with everything in there from the start. Age the beer for on the order of 6 months, perhaps a month or two longer, before packaging. And make sure that the FG is stable. Oak would probably be for the ideal fermentation vessel, or at least for aging, but glass or stainless would also work fine. To me much of the important substance of both recipes is the same - 100% winter 6 row barley, roughly 3 kg hops from the general region (Belgian or Northern French hops) per 100 kg grain, a long boil (>5 hours) and aging until late summer/early fall (so about 6-8 months from brew to serving the beer). Both recipes also include a fair amount of hops added later in the boil where they could be more flavor-active, even though the beer will be aged for a while. In my experience with beers for aging with noble hops or similar, this can hold up pretty well. So I expect hop flavor from these hops does carry through to the finished beer. The infusion recipe lists 40% with one hour left and the turbid mash includes 2/3 of the hops with only 30 minutes left. These 'late' hops will see a fair amount of boil, which may come as a surprise to people used to more of the modern N American brewing process, but there should still be a flavor impact with noble-type hops at these boil and aging times. While the two recipes call for basically the same total hop load, the splitting and timing of additions creates some interesting distinction. The infusion recipe calls for 60% of the hops to be boiled for at least 5 hours, and the remaining 40% are boiled for an hour. Additionally, the infusion recipe mentions Bavarian hops for the last hour. It looks like I may have forgotten to include this in the infusion recipe post itself, and that post will be updated to include this. This could be a non-trivial point for flavor, bitterness and microbiological progression, so I'm sorry about that. Other sources at this time mention these hops are more antibacterial than Belgian hops. This may be due to varieties as well as growing conditions or general hop quality. So this hop origin choice combined with the timing of the addition and the split favoring longer boils in this recipe may lead to a more bitter and less acidic saison, when comparing the two recipes. Furthermore, in the recipe calculations I've used a lower aa hop which would suppress the calculated IBUs, resulting in a beer that, on paper, seems less bitter than it should have been (see below for more on this). On the other hand, the turbid mash recipe calls for only 1/3 of the hops to be boiled for more than 30 minutes. This would strongly favor carrying hop flavor through compared to the infusion recipe. Consequently this beer would likely have been less bitter (as is reflected in the theoretical IBUs, as the TM recipe calculated to ~30% less bitter than the infusion recipe) and could lead to a beer with more acidity along with the hop flavor. This shows the spread of saison at the time (something Yvan de Baets notes in his history of saison chapter in Farmhouse Ales), that historic saisons would have prominent bitterness or acidity. On the mash side, I think the nature of these two mashes illustrates the brewing mentality to these beers pretty well. There is definitely not one mash to brew saisons, and these two mashes have some strong differences in terms of process. But there are also some core details that are fairly similar, and which are similar to some saison mashes still conducted today (see this post, for example). Both mashes have a rest around 53° C (~130° F) and saccharification steps that, especially for modern saison, are quite high - both include saccharification steps at or above 71° C (~160° F). Furthermore, these were not short saccharification rests, so they definitely served a purpose. But the differences between these two mashes highlights some variability in process: doing a low temperature soak of the grain or not, spending an extended time in protein rest temperatures or just a quick rest, one or two saccharification rests, etc. Finally, the saccharification temp difference between these mashes and modern saison could reflect some differences in the brewing and the nature of saison. If you were aging it for 6+ months with a mixed culture then perhaps maximizing fermentability to Saccharomyces c. wouldn't be as much of an issue. For both of these recipes, I have dropped the hopping rate down a bit in my homebrew adaptations. There are many complicating factors that could make my decision to drop this down better or worse. To be honest, I forgot I had done it until I was writing this second post. One of the main things I was thinking about was hop aa levels increasing over time, mostly based on varieties but also a bit on quality of hops. But I hadn't considered that the hopping rates are referenced to malt amounts, and grain has changed quite a bit as well such that less grain is needed now to get the same extract. This would act to reduce the hopping rate per volume, and would result in my calculation of hopping rates being artificially low, so my adjustment to further lower the hopping rates may have been flawed. This may be counteracted a bit by my homebrew-level total efficiency of 75%, which is lower than many commercial breweries. (Edit 27-Mar-18) I also didn't consider that efficiency of hop use drops on smaller scales as well, which may suggest that I was overly-cautious in scaling back the hops as I did for this homebrew recipe. Anyway, I'll leave the rates in these recipes as 100 g, but I feel less confident in this now. As I haven't had a chance to brew these, I can't see if I think the resulting bitterness from what I've listed is reasonable. If you want to try to come closer to the exact rates in the text that would be about 125 g per 19 L batch, and please report back if you go with this rate. It should be easy to adjust as the recipe is based on percentages at different times. As I noted above, I'm feeling less solid about my choice to scale the hops back a bit, but I think there are arguments to be made for and against this and it is hard to balance them all out with the uncertainty in each. Whatever you chose to do, I wanted to let you know my thinking and the uncertainty that remains. Regarding the hopping rates and bitterness, I want to note a few things. First, this should be taken as a rough estimate. I’ve simply chosen a low aa modern hop, and variability in this value would result in a fair amount of variability in bitterness in the beer. 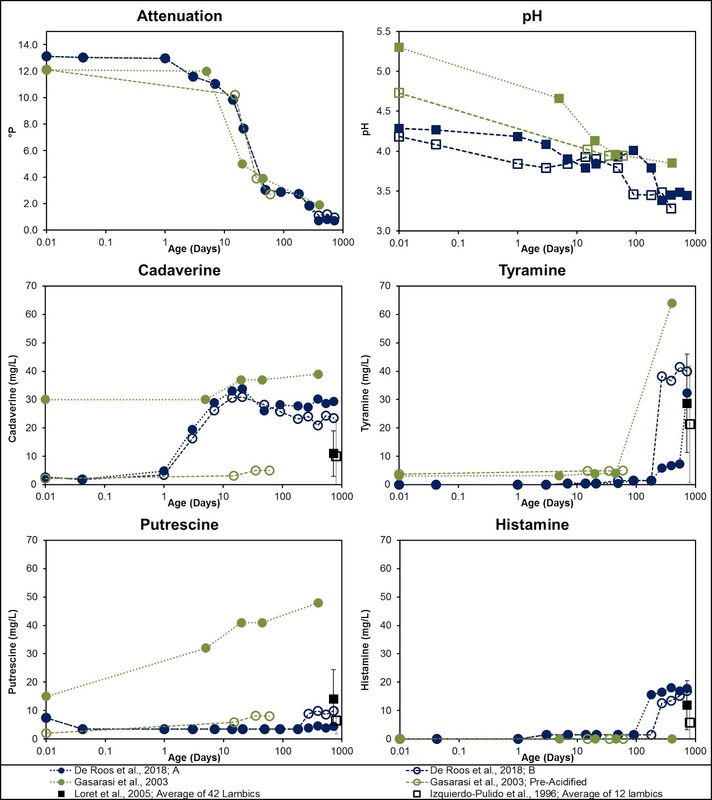 Finally, there are other components that would contribute to perceived bitterness than isomerized alpha acids (e.g. tannins and beta acids). And by taking a larger amount of low acid hops (possibly poorly stored hops by modern standards) and putting them through a prolonged boil, I think you are going to get a higher perceived bitterness than the same amount of total alpha acid from a high aa hop. So I’d expect these beers to appear a fair bit higher than 30-35 IBU. And finally, as noted above, I've dropped the hopping rates by about 20% from those presented in the original recipes. So on the whole I would treat both of these beers as more bitter than the theoretical IBUs presented here would suggest. And I would caution anyone trying to hit the same IBUs here but with high aa hops and trying to come out with a beers that would be perceived similarly or trying to brew with more historical accuracy, as the use of lower rates of high aa hops would probably further soften the beers. And I think this would move the beers further from their original nature. If you want to brew with high alpha bittering additions that's fine, as long as you recognize that this would create a different beer less in line with the history. And of course, there's nothing wrong with that.